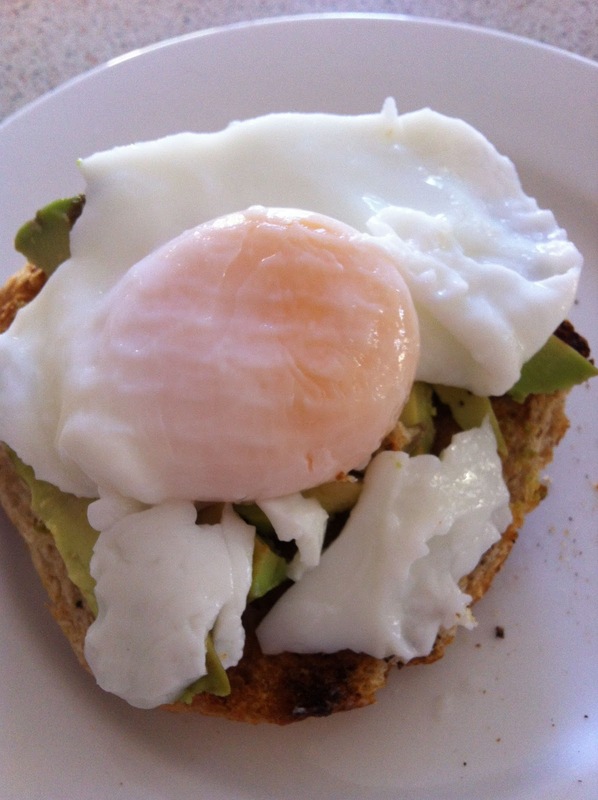 Have you ever poached an egg? My mother was in SHOCK when she saw my mother in-law cracking eggs into a little pot of boiling water because she's never made them in her life.... come to find out after asking a few other people, apparently it's not common knowledge or practice to poach eggs! 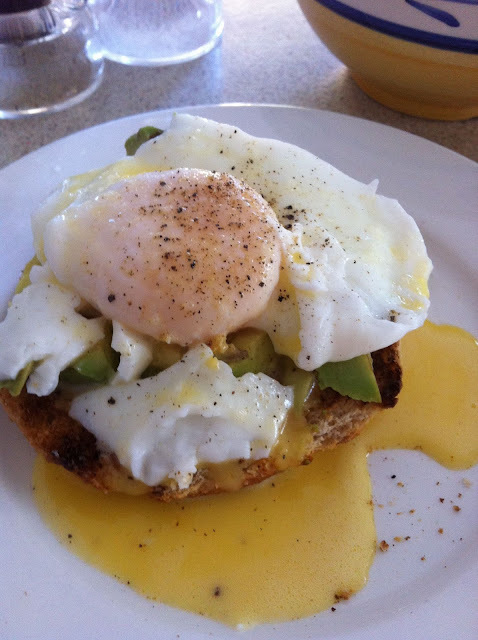 It's fairly commonplace here at Sydney restaurants, however, to serve poached eggs, and I've been FULLY partaking! So, I thought it would be a fun little post to show you how to poach an egg! Coincidently enough, I've also been dying to master my own hollandaise sauce. Don't you just think that most times when you order an eggs benedict, the first bite is blissful and then all of the sudden you want to stick your finger down your throat because you feel like you just drank fat juice? That's how I feel anyways, haha! HOWEVER, the other day at The Big Brekky, the place I was telling you about here, I tasted the best hollandaise I think in existence and it inspired me to master it myself! Today I gave it a valiant effort! I succeeded! Now, it's definitely just your basic hollandaise sauce ... nothing fancy in it yet A) because I wanted to master the basic first and B) because I didn't have all the fancy ingredients I wanted to try on hand since I just got inspired off the cuff and didn't plan ahead. (by "off the cuff" I mean I sat down and watched 'Julie & Julia' and immediately went to the kitchen when it was through... yeah, I'm totally like that) I'll probably try a fancier one in the next few days and post about that as well.. my sister in-law, Jodie wants to try it with me so watch out! She's a wild woman in the kitchen! Anyways, here's two basic little things to try for breakfast, lunch or dinner! Note: If you're going to try eggs benedict for dinner, serve it with thick crusty sourdough toast, sliced peppered tomatoes and a great bottle of red wine! :) Eggs for dinner... it truly is a wondrous thing, try it sometime. Start with the hollandaise sauce... it takes longer than poaching an egg! 2 & 1/2 or 3 egg yolks. Get out a little saucepan/ pot and drop in the egg yolks, water and lemon juice. Turn the heat to a lower 'medium-low' and start to whisk away! Keep whisking! Now whisk some more. When you start to see fairly foamy, white bubbles, keep whisking! Now just keep whisking..... then, whisk. (over kill I know, sorry... it's just so true) The goal during this process is to NOT cook the eggs. The way we do that is to just keep pulling the saucepan off the heat every few moments. So whisk whisk whisk, take off the heat and whisk some more. Repeat, repeat, repeat. Just be mindful that you don't want to be seeing floating chunks of cooked egg and you're good. Once that mixture looks thick and really foamy, turn the heat off and keep it off. Now start to add little dollops of the softened butter and whisk well until you've added in all the butter. Now keep whisking. :) This is where you want to get the texture silky, thick and smooth. Depending on how fast you whisk, you could possibly be doing this step for 10 minutes. It' definitely worth it if you do, but if you don't want to be whisking that long, you can use your electric mixer. (I don't recommend it though, you'll feel SO much less French doing it that way and that's NEVER a good feeling in the kitchen) Now you're mostly finished! Add in a dash of the white pepper and salt and taste it! If it needs a little more tanginess, which I find it always does, squeeze in a little more lemon juice and whisk it in... Voila! 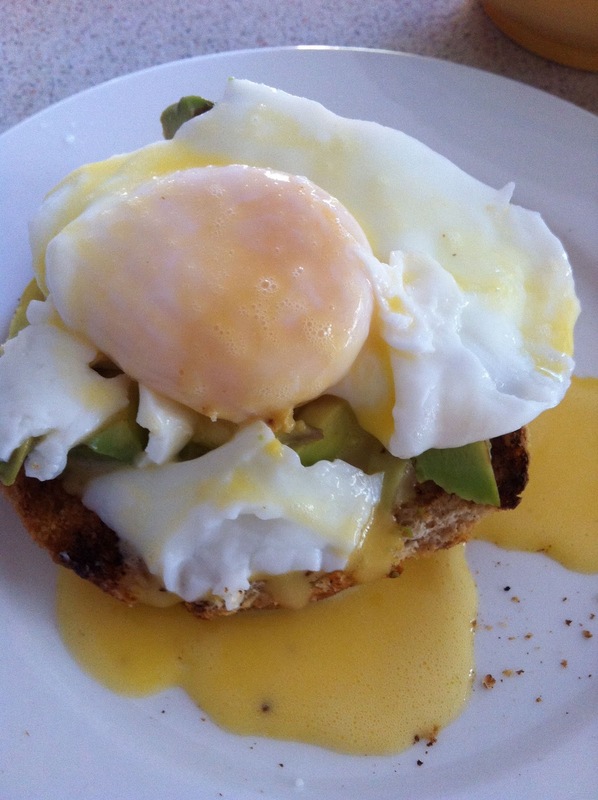 Now set that aside and let's poach your egg. I like to rinse out that same little saucepan I used for the hollandaise and just use that. Fill your saucepan with water maybe 2 inches deep. Toss in a little salt to help it boil quicker and put it on high heat to boil. 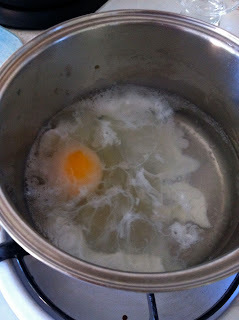 Once your water is boiling, crack the egg gently right into the pot. Note: the closer to the water surface you can crack the egg, the better. the yolk tends to break pretty easily in boiling water if you're not gentle. Let it keep boiling for about 10-15 seconds and then turn the heat completely off. Now put the lid on the pot and wait 3-4 minutes. Don't open the lid or get antsy and think you have to get it out. Just leave it for 3-4 minutes. In the meantime, prepare your toast! I like to use whole grain toast or sourdough. English muffins are, of course, the classic but I don't usually buy or make those. Plus, I like something a little more substantial under my gooey egg. (ok, mouth is watering right about now and I just ate one!) My ideal would be to slightly butter my toast and add wilted spinach and tomato before topping with the egg and sauce. Today I only had some toast and avocado to work with so, apologies for the not-so-gorgeous benedict photo. It still was TOTALLY delicious however, so, I guess I don't apologize! :) SO, after the 3-4 minutes have gone by, open the lid and scoop out the egg with a slotted spoon. If you don't have a slotted spoon, use a spatula, preferably one with slits in it to let the excess water drip off. If you're just making one egg and you don't mind waiting a minute, just stand there with the egg and let the excess water really drip mostly off so you're not eating a slippery, wet egg. If you're making poached eggs for a few people, just have a little side dinner plate on hand and top it with a few folded paper towels. Then slide the egg right on the towels to dry for a minute. (they come off just fine, don't worry about them sticking to the paper towel) Now top your toast with your egg and top your egg with your delicious, homemade hollandaise sauce and ENJOY! It will be such a tasty, buttery, delightful experience.... THAT, I can promise! whisking eggs, water and lemon juice. yes, you'll go through a phase where it looks watery and thin, keep whisking. this is what you're going for. whisk in the last few bits and you're done! 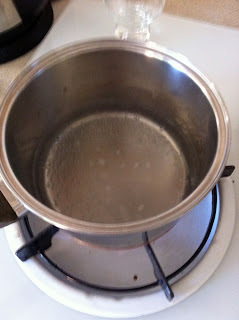 water boiling... horrible photo, I'm sorry about that. looks gross and like you did something wrong, but that's exactly the way it should look. those are just paper towel lines. YUM! doesn't that look delicious??? Happy eggs and sauce, you guys... talk to you soon!